There is white smoke flowing from the Fly DSA Arena’s chimney this morning. That’s after the official confirmation that Aaron Fox had agreed and signed a new three year contract to boss the Steelers. Aaron will be responsible for the recruitment of a new side for next season and coaching it to success, we can all argue what success is but that’s for another day. Why Aaron? Well the honest answer is that we felt he was the right man for the job. A perfect fit for what we were looking for, for this specific job in Sheffield. We interviewed many coaches, some twice, some three times. Some were more experienced than others, some with great resumes throughout North America and Europe. Coaching in the UK and especially Sheffield though requires unique talents, the most of which is the ability to coach and recruit your own team. Forget these other clubs who have full time GMs and you think they recruit. They don’t. They assist, they help but those people Messrs Kelman, Thornton and Moran to name but three are what we would call in the outside world Managing Directors. The word GM is a hockey word for that position. Andrew Lord, Adam Keefe, whoever is Nottingham’s next coach and Aaron Fox, our new boss are the recruiters. Others can be part of the process but it’s the coaches in the UK who decide who comes and who goes, and that’s exactly how it should be. Aaron’s experience is in this field, as well as playing at a high level and being involved with coaching, including the position of head coach it is recruitment that he has specialised with over the past 5 years in Zagreb. It’s what first identified him out as a candidate some months ago. My first conversation with Aaron was when I helped bring John Armstrong back from Croatia. I then spoke with him again when we acquired Tom Zanoski a month or so down the line. Another period of time had elapsed when an agent suggested that we look at Aaron for this position. We hadn’t even known he was interested and took references. Then we called him and there was an interest from him. Owner Tony Smith took the decision to interview Aaron face to face, opposed to the many phone and face time calls we had with other candidates. Aaron flew in on the day of the 6-1 home defeat to Glasgow. Earlier in the day we had spent many hours with him, then we had shown him the facilities at the arena, Ice Sheffield and the Institute of Sport. I actually think the 6-1 result was the best thing to happen that night, he saw first hand the size of the job ahead. Better than any web cast or video. Within a couple of weeks Tony and Aaron had come to terms, a new 3 year contract. Work started many weeks ago which is why on Tuesday we were able to announce so much. 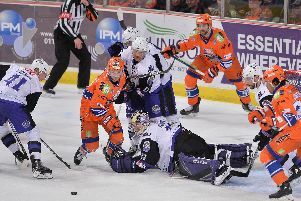 Video: How Aaron Fox saw Sheffield Steelers get hit for six...and still signed with them! The return of Messrs Dowd, J. Phillips, D. Phillips, Brown and DeLuca on new contracts. The arrival of Marc-Olivier Vallerand and new apprentice Alex Graham. Three home pre-season games against opposition from Slovakia and Hungary. So much has already happened but there is so much more still to do. Expect changes and many of them, the Steelers can’t finish 7th, not make the cup semi finals or the play off championship weekend and accept that. Aaron in his interviews and speech at the fan forum asked for patience. He was quiet right, if we haven’t made another signing by June then don’t panic. If it takes until July then so be it. This, more so than any other summer is one we have to get right. I like the fact that Aaron and his family are joining us full time in two weeks time, he will be here in Sheffield, working with us all promoting the club and looking forward to an exciting season ahead. We have placed great trus in his hands and every time I speak to him I feel happier with the decision we have made. He has Tony’s full backing and all of our support, I hope he has yours as well. Roll on August is what I say.